When you are creating or growing a business, structure and a strong foundation to grow on are crucial. You need a plan to refer to, a structured list to keep you from becoming side tracked and focus your vision. It needs to be organized in manageable steps that make sense, are clear cut, and are easy to follow. Without a detailed organized plan in place, nothing would ever get accomplished. I mean think about it, if you try to conquer everything you won’t accomplish anything at all. Your resources and your time will be spread too thin. Focusing on many things you want to accomplish doesn’t mean you can accomplish more. This creates an unstable foundation for your company. This foundation is full of cracks and holes that causes mass confusion throughout the business because no one knows which way they should be going. The structure bellow you then falls apart. Face it, those dreaded words of organized list making are essential to fixing this problem. They are the glue that helps hold your company together strengthening your business for its future growth. Now for the hard part: What list should I create first? Al Levi explains that planning power is the first power, or first item, that needs to be addressed in a business. It is something that is always on in the background because you are always planning, always finding new opportunities and building them into your business. Making goals, or destinations, for your business is the easy part. You know where you want to end up, financially comfortable, wealthy, and essentially free. The journey to get there is the part that is ever changing and needs to be planned properly. Without setting milestones, ways to measure your progress, and having a clear cut list of steps for your journey you can become sidetracked and lead your company into a direction that does not bring you anywhere near where you want to be. Without those lists and without organization, you may even miss key elements or processes that can leave you not safe legally. Your leadership will steer the planning in an even more precise and clear path, and it will get your entire team there faster because you can filter these milestones and tasks down to the bare essentials. As a business owner, you not only need these lists and for them to be organized, but you need to be confident that they ARE what will get you to your destination and stick to them with everyone in your company to create uniformity and dedication. As Al says, it helps to ensure that you are working on the right thing, at the right time, in the right way to make your business goal a reality. Now that I have droned on and on about the importance of organized lists, we can dive in to how to make them the right way. You are the man (or woman) on top in your company. However, you are not the only person involved in moving your company forward in a more organized manner. You have placed managers and supervisors, people who you entrust to carry on business when you are not there, the right way and in a manner that correctly reflects the company. These people should be part of the list making process to help get everyone in all the departments on the same page working on the right tasks. So, your initial meeting, the one where you are sitting down to start creating a “master list” should include them. 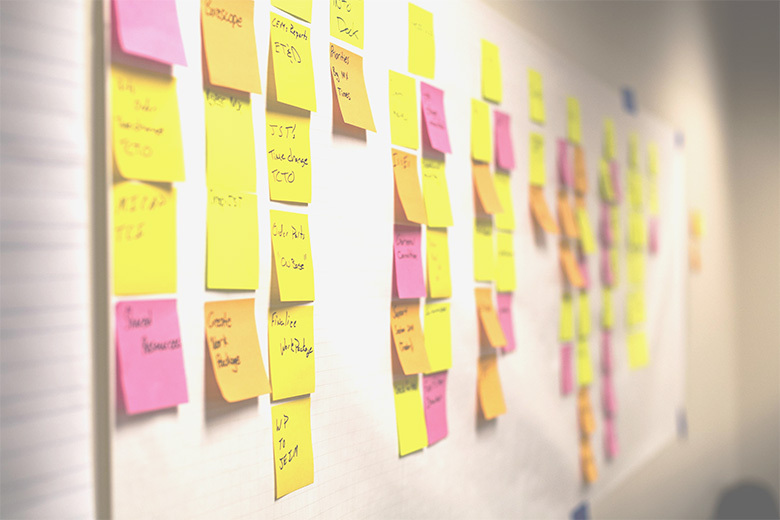 Start your brainstorming session by listing out all of the projects that are already in progress. Have everyone explain them as they are managing them. This will help you see if there are any projects being conquered by more than one \person, which is not needed and a waste or time, while also understanding how your leadership has manifested. These main projects are ones that you established, or these managers and higher ups, think you wanted them to be spending their time. Is that time being wasted? Are these tasks ones that are actually working for your company towards its growth? You will be surprised to see that they don’t all fit together, that it is a list of unorganized chaos that has been keeping your company from creating that strong foundation necessary. THAT IS OKAY!! We are going to fix that. Now, on a separate paper, or white board if you want it to be large and easy for everyone to see, write out projects and habits that everyone feels should be worked on in the next year or so. Some of these may come from the list that you previously made, or they may be brand new. Include things like operation manuals, which are comprehensive documentation of how your company functions providing clear guidance for employees to perform, patterns of behavior, steps of delegation, time tracking, corrective action, etc. This will be your “master list”. After creating this list, try to filter it down to your top 30. You don’t have to throw out any of the ideas you came up with, but you may be able to combine some or even make the call that they are things that can be worked on the following year. These 30 should either solve your biggest problems or challenges or give your company the greatest chance to grow and be more profitable within the coming year. Your goal by the end of this meeting is to get to your top 5, but DO NOT JUST JUMP TO THE END. company. Keep track of those 30 because after you accomplish this original 5 you can bring the next 5 up off of the list until you have completed all 30 within the year. We must now work with that top 5 to create an organized chart, I know those words again. Bear with me, you are almost done. On a large white board or poster board, make three columns across the top for what you need (item), why you need it (justify the project), and status (progress and feedback). Great job, you made it through a very grueling and, in some cases, mentally painful process. What you have created, however, is a neat, organized list of the top 5 projects your company is working on right now to move the business forward in a positive manner. You even made it large and can post it now where all staff can see it which will help everyone stay on top of the projects. Make sure when you unveil your masterpiece, because it really is that after all the time you spent making it, to the rest of the staff, make sure it is in a positive way. Remember that all of these people who work for you and with you are used to the unorganized chaos you started with. This change is something your entire company is undertaking together, and as a business owner you know everyone in your business is important to the company’s success. Through regular meetings, actively listening to feedback people in the company have, and making sure you take a part of each week working on your top five, you will be able to see the change for the better in your company. There will be more strength in its foundations and everyone will be working together towards that goal destination. Congratulations, and I look forward to hearing your stories of success and organization. If you have any questions or comments, please do not hesitate to post them here. I will respond as quickly as possible. Include topics that you are in need of help with as well and they will be included in future blog posts. Enjoy the rest of your day, and remember, we are all in this together.